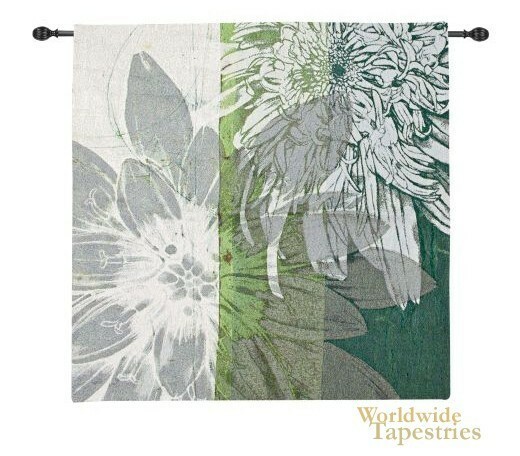 Graphic Blooms II tapestry shows a contemporary floral tapestry in green tones. This work, like its companion scene "Graphic Blooms I" we see detailed illustrations of 2 flowers in full bloom, on a green background. This work brings the beauty of nature into the home, in a modern way. Flowers and natural elements have been inspiration for art for centuries and here we see this inspiring art in modern style. Graphic Blooms II tapestry is lined and has a tunnel for easy hanging.